12 Minutes of Decision Making. In order to fight fire properly, it is necessary for those of us who practice it; to understand, not only what we do but why we have to do it. No fireman can ever be considered to have attained a real proficiency in this business until he has thoroughly mastered the combination of theory and practice. “12 Minutes of Decision Making”, brings theory and practice together. Requiring over 2 years to develop; this class, prepared and presented by Stan Merrett, a 39 year veteran of the Alabama Fire Service, is a mixture of humor and serious commentary. The presentation contains over 100 imbedded Video Clips, (3 hrs) which present the real world of firefighting and reinforces the talking points made in the seminar. The presentation centers around NIOSH findings that, “Extreme Fire Behavior”, (Backdraft, Flashover and Smoke Explosions) normally occurs within the first 12 minutes of a call. 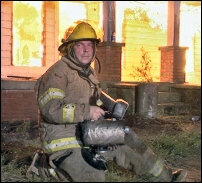 This 16 hr class will definitely open your eyes to things that can and do go wrong, while on the fireground. It is a great opportunity for all firefighters regardless of your training, Career or Volunteer, to engage in a unique training experience, dealing specifically with fighting fires. Topics include; Fundamentals of Decision Making, Fireground Operations, Reading Smoke, Firefighting Safety, Survival in Hostile Environments and group review of NIOSH Case Studies.